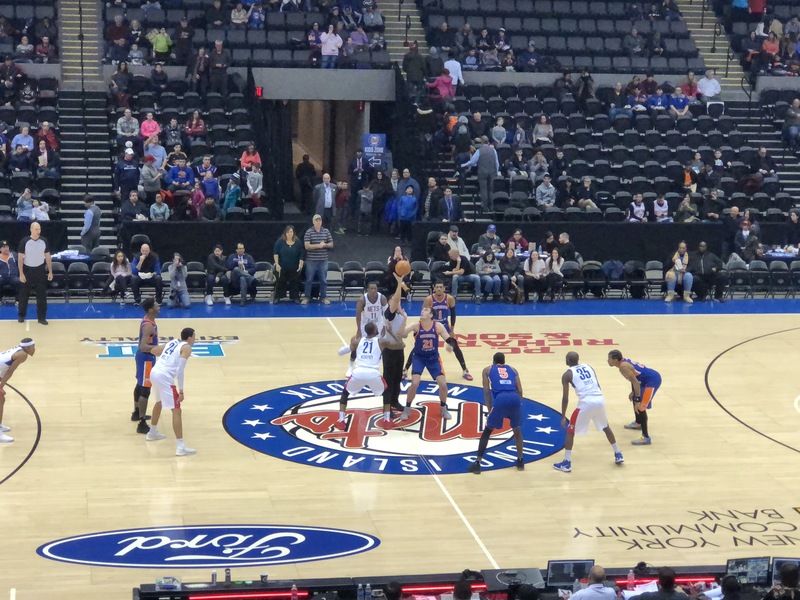 The last game of the year for the Long Island Nets did not disappoint. Their opponent shares the same division and is also a crosstown rival to the team. The Westchester Knicks with their star guard Trey Burke who is 3rd in most points scored per game were definitely ready for the battle. The Nets are resilient and seem to never fold though they may be down big. Following a come from behind victory in their last game the Nets looked to repeat that effort to end the year with a good win. The Knicks had a great aggressive start to the game. The team had a bunch of contributors that help put them in a great position to win. Whether it was Trey Burke’s 34 point/ 6 rebounds performance or Xavier Rathan-Mayes who seem to still have the hot hand scoring 26 and grabbing 6 rebounds, after scoring his career high 33 over the Fort Wayne Mad Ants. Trey Burke with another huge scoring night. Though the first quarter was competitive and ended with just a 3-point deficit. The Nets allowed the Knicks to score 35 points in the 2nd quarter and at one point be down 16 points to their crosstown rival. Though the Nets struggled to shoot a decent percentage from the field and free throw line all game, they came out of halftime a different team. Not only did they score 26 points, they held the Knicks to 17 points the whole quarter. Milton Doyle who return after missing last game wasn’t very accurate with his shot, however that did not keep him from filling up the stat sheet. He scored 16 points, dished out 8 assists and pulled down 6 rebounds. After a short run by the Nets towards the end of the 3rd quarter, the Nets had pulled within 2 points of the Knicks. Early on in the 4th quarter the Nets showed their fight and heart as they continued to be the aggressors and even enjoyed a 3-point lead. Milton Doyle never afraid to let it fly. Just as everything seemed to be following the narrative of last game the Knicks regrouped and took back the short-lived Nets’ lead. After regaining the lead, the Knicks ended up pulling away from the Nets and winning by 12 points. This was a tough loss for the Nets, who with that lost fell to 2nd place in the Atlantic division. The Nets look to bounce back and start the new year right with a win over the Austin Spurs Tuesday night.